« UAW – GM Contract Talks. Another trip down Memory Lane. A story from the other side of the lens. 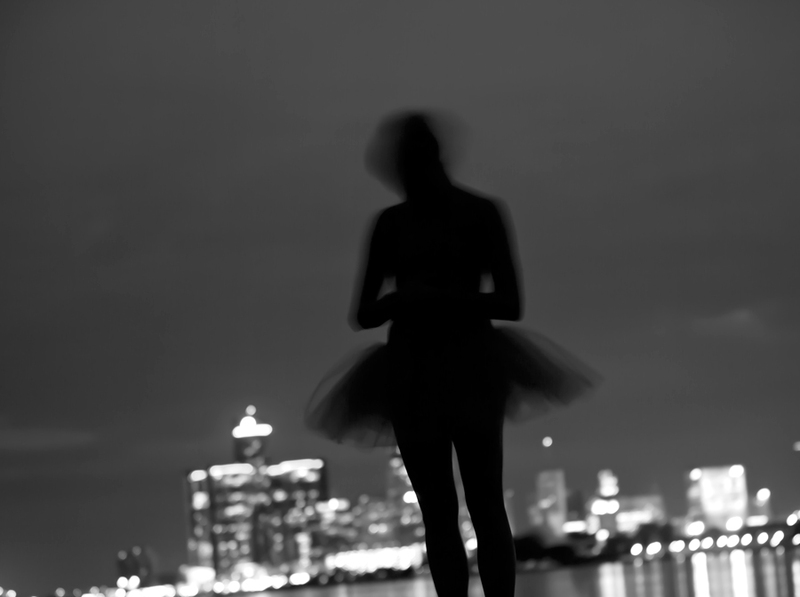 My plan was to make a picture of a ballerina on a rooftop flying with Detroit in the background. No matter how I pitched the idea to get permissions, a rooftop and a ballerina the response was the same: you want to do what? Being a New Yorker I don’t discourage easily. This simple photo shoot not only became a test determination, but was also a life-changing event. I never believed you get anywhere on you own. Michelle, whom I met when I first came to Detroit years ago, my longest and dearest friend came to my aid. Although born and raised in Detroit, Michelle has more New Yorker in her than New Yorkers. She was able to get a willing ballerina. Very beautiful and graceful, Laura never flinched when I told her I want her to jump, make a 180 with her legs, at a specific mark, on top of a roof, at night, as I pop a strobe in her face. I was good to go, well almost. It seems the State’s recent relationship with the film industry has many looking for location fees. It’s not unusual for production companies to pay location fees. This shoot was a personal effort, not commercial. In other words, no budget. No matter, I was told there would be a fee. OK, back to the drawing board. I started to think of Sondheim’s “Putting it Together,” with the lyric, art isn’t easy. Earlier in the year I shot by an abandoned warehouse and thought this would be a tremendous place to do this shoot. The building has a beauty all it own. In many ways the film industry did me a favor. However, being in an abandoned warehouse had its issues. So another dear friend, Bill came to my rescue. An accomplished photographer, he agreed to help with light, not an east feat. I still wanted my leaping picture, so it was time for a little more due diligence. After the warehouse we needed to dash to get the sunset for our next location. The night couldn’t be more perfect. No wind, great sky. Laura was flawless. Bill, holding a mono pod with an umbrella, strobe light and battery pack with the ability to move at a moments notice was priceless. I might have been the guy who pressed the button on the camera, but it was dear friends, a beautiful ballerina, and the beauty of what Detroit is and once was that made a series of pictures worth the effort. This entry was posted in General News, Recent Assignments. Absolutely brillant and so beautiful. A look into the sometimes hidden beauties in life!! !